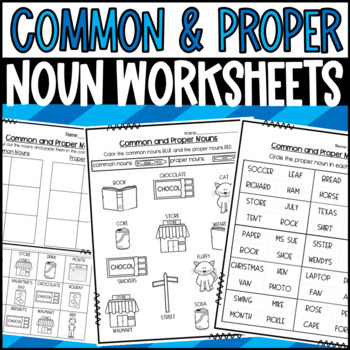 Fun resources for students to practice identifying common nouns and proper nouns! 24 cards (color and black and white) each with one proper noun and one common noun. 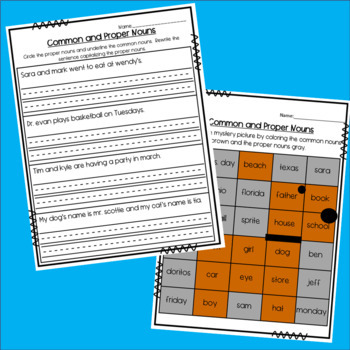 This can be used as a game where students draw a card and correctly identify which noun is the proper noun and which is the common noun OR it can be used as a center activity where students draw a card and identify which is the proper noun and which is the common noun and record their answers on the recording sheet. 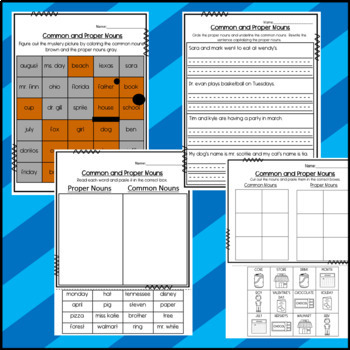 Sort- Students read the word and decide if the noun is a proper noun or common noun and glue it in the appropriate box. Mystery picture- Students color the common nouns blue and the proper nouns brown to reveal a mystery picture (a worm).